NCIS star Pauley Perrette teams with Justice League alum George Newbern in animated Blu-rayTM Combo Pack & DVD version of Joe Kelly's heralded "What's So Funny About Truth, Justice and the American Way?" The Man of Steel comes face-to-face with powerful villains, daunting rivals and a society more interested in retribution than justice when a new, less-ethical breed of super hero arrives in Metropolis in Superman vs. 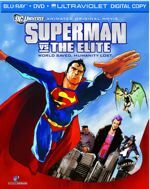 The Elite, the next entry in the popular, ongoing series of DC Universe Animated Original Movies. Produced by Warner Premiere, DC Entertainment and Warner Bros. Animation, the all-new, PG-13 rated film arrives June 12, 2012 from Warner Home Video as a Blu-rayTM Combo Pack ($24.98 SRP) and DVD ($19.98 SRP), On Demand and for Download. Both the Blu-rayTM Combo Pack and DVD will include an UltraVioletTM Digital Copy. Award-winning comics writer Joe Kelly has crafted a taut, thrilling screenplay, adapted from the original 2001 DC Comics release, "What's So Funny About Truth, Justice and the American Way?," by Kelly and Doug Mahnke with Lee Bermejo. The single-issue comic, Action Comics #775, was lauded by Wizard Magazine as the "Greatest Superman Story of All Time," and ranked the epic tale at No. 21 on its list of the "Top 100 Comics of the last 30 years." "Superman vs. The Elite adds to the rich legacy of the DC Universe Animated Original Movies series, spotlighting an important chapter in the annals of Man of Steel stories," said Mary Ellen Thomas, Warner Home Video Vice President, Family & Animation and Partner Brands Marketing. "Bringing back George Newbern gives the film a nice touch of nostalgia for fans of the Justice League animated series, and Pauley Perrette gives Lois Lane altogether new dimensions with her performance." Featurette - "The Elite Unbound: No Rules, No Mercy" - A short documentary focused upon The Elite, and their arc of character throughout the comics. Even the anti-heroes have their own struggles ... and triumphs. It's all highlighted in this compelling film that begins with the inspiration of The Authority, and how The Elite became the answer to that book, and a fresh approach for DC Comics in the post 9/11 world. It was an unexpected twist to the pages of Action Comics, and this documentary summarizes the true potency of these Elite. Featurette - "Superman and the Moral Debate" - There's a prevailing thought about ending terrorism and ridding our Earth of the maladjusted once and for all - by fighting fire with fire! This is the story of The Elite, a band of fringe Superheroes who were compelled to eradicate the Earth of its scum, its tyranny and evil once and for all, not with words, but with raw unadulterated action, designed to kill their opponents. This is their controversial story. Digital Comic - Action Comics #775 - "What's So Funny About Truth, Justice & the American Way?" * Superman vs. The Elite UltraViolet Digital Copy is a limited time offer. Restrictions and limitations apply. Go to ultraviolet.flixster.com/info for details.